It’s amazing what some people can do with a few dozen rolls of toilet paper and a lot of creativity. 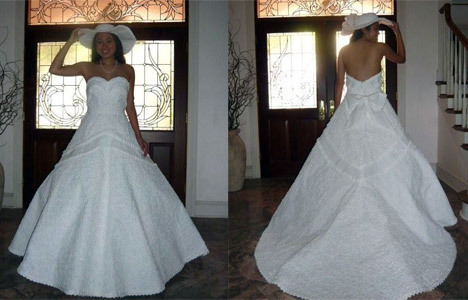 A few months back, we did a feature on the 2010 Toilet Paper Wedding Dress Contest by Cheap Chic Weddings. The story attracted quite a bit of attention, and we’re very pleased to share that one of the contest’s participants sent us a message detailing her experience on the annual event. Katherine Moon, who hails from Chatham, Ontario, has joined the contest for the past two years. In 2009, her toilet paper dress won 6th place, while her 2010 creation placed 4th—a very impressive achievement, seeing as how Katherine was pitted against 900 participants from all over the world. Katherine’s dress for 2009 was a very memorable one, as it was featured in an online video for being the only dress that used pink toilet paper. Her latest creation was also featured on Cheap Chic’s website. Her other entries include a bouquet, headpiece and even a pair of high heels made from toilet paper. Needless to say, Katherine had an amazing time working on her entries and seeing them featured on the site. As a disabled retiree, the experience was even more fulfilling. If you’re thinking of checking out Katherine Moon’s dresses, you can troop down to the Ripley’s Believe it or Not Museums in Queensland, Australia. Watch out for the next installment of Toilet Paper Wedding Dress Contest by Cheap Chic Weddings. This year’s contest is about to start soon, so keep your eyes peeled for updates.